Startled groundhogs may surprise hikers with their speed, or what appears to be their speed. In late fall, chunky groundhogs appear to waddle across the terrain, but if you blink, they frequently disappear from sight. This knack for vanishing leads some observers to believe the mysterious groundhog runs fast. While many animals are fast when startled or needing to defend themselves, the reality is that groundhogs are not fast runners -- they use other strategies to avoid danger. Groundhogs burrow and, as the story goes, on Feb. 2 they climb out of their dens and briefly end hibernation to look for their shadows. Prior to hibernating, the groundhog eats a lot, and his body plumps up. These reserves get him through the lengthy hibernation. As his body gets fuller he waddles and his speed decreases. Upon leaving the den after hibernation, most of these reserves have been depleted and he appears much thinner. He’s also capable of a slightly faster movement, but at all times his normal gait when undisturbed is a waddle. He walks and nibbles and stops, watches for predators, then waddles and nibbles some more. 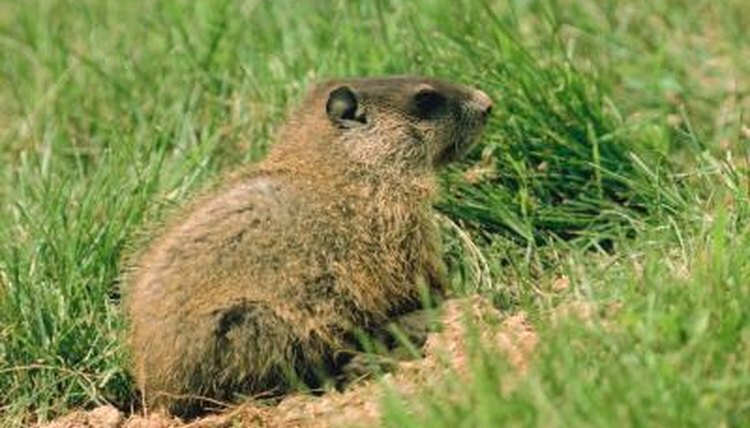 Groundhogs, or marmots (Marmota monax), are also called whistle pigs for several reasons. They eat and sleep a lot, basking in the sun on rocks, logs and fence posts. They prefer living solitary lives in their own dens, although their dens are usually in colonies close to other groundhogs. While eating they watch for predators, and when alarmed they whistle. They rarely travel further than 50 feet from their dens, which have numerous entry holes. When alarmed they chatter through their teeth, creating the whistling sound that alerts nearby groundhogs. Groundhogs don’t run for exercise, or for play, but instead they run to escape harm. They can be compared to sprinters rather than long-distance runners. When frightened they run short distances for the closest burrow entrance. Their low-slung bodies typically move at 3 kph (1.86 mph), but when alarmed they gallop along at 16 kph (9.94 mph). In addition to being capable of running short distances, this burrowing animal can swim as well as climb when necessary. Alarmed groundhogs dive into the closest burrow entrance -- not always theirs, although they prefer their own dens. Dens tend to consist of an extensive network of interconnecting tunnels, with a main burrow entrance near a large boulder or log. It’s twice the diameter of the 15-centimeter (6-inch) tunnels. Tunnels can be 45 feet long and five feet below the soil’s surface. The plunge holes, or auxiliary entrances, are smaller and inconspicuous, with as many as 11 auxiliary entrances. Underground pathways connect to a system of chambers. When accidentally frightening a groundhog while out walking, a hiker might see the small mammal only briefly before it disappears from sight -- but it probably didn't run far or fast, it most likely plunged into a nearby burrow. Carol Knepp has been writing since 1983, with work published in the "Denver Post," "Green Thumb News," "Westlake Picayune" and on multiple websites. Knepp is a professional gardener, forester, and educator with experience at two botanic gardens, a wilderness preserve nature center and has two degrees, Forestry and Elementary/Pre-K Education. What Is the Speed of a Bobcat? What Animal Goes to Sleep for Most of the Winter? When Are Grizzly Bears Awake & When Do They Sleep?